α-Fetoprotein (AFP) was discovered by Abelev et al. in 19631 and its concentration was found to be elevated in serum of patients with hepatocellular carcinoma (HCC) by Alpert et al. in 19712. AFP is produced by normal liver of fetus. Concentration of AFP in fetus blood is very high. It is replaced by albumin several weeks after birth. Thus, AFP is an oncofetal protein. AFP is the most popular biomarker for HCC and has been used worldwide for diagnosis and prognosis for 40 years. However, its level is also increased in patients with benign liver diseases such as chronic hepatitis and liver cirrhosis, so the specificity of AFP is not conclusive. An AFP molecule has one N-linked bi-antennary carbohydrate chain and its major structure has been reported. Bog-Hansen et al. in 1973 and Breborowicz et al. in 1981 reported microheterogeneity of carbohydrate chain of AFP in HCC3,4. The diagnostic significance of microheterogeneity of the carbohydrate chain of AFP has been reported by Aoyagi et al. in 1988 and by Taketa et al. in 1990 using lectin. In previous reports, the major changes of the carbohydrate chain in HCC are the addition of α1-6 fucose to core GlcNAc and sialic acid to the outer chain7,8 The former was named AFP-L3 based on the definition of band separation by lectin affinity electrophoresis (Fig. 1). AFP-L3 was measured by lectin agarose gel electrophoresis5, lectin affinity electrophoresis6,7, LCA lectin and antibody competitive method8 and microchip capillary electrophoresis11 using α1-6 fucose-specific lectin. The detection sensitivity and accuracy of AFP-L3 differ by assay. The clinical significance of AFP-L3 increased with higher detection sensitivity at low AFP concentrations. The addition of sialic acid was measured by lectin electrophoresis7 and iso-electrophoresis13. The most useful method of determining microheterogeneity of AFP for HCC diagnosis is the addition of α1-6 fucose: AFP-L3. No correlation was observed between AFP concentration and AFP-L3% (percentage of AFP-L3 to total AFP concentration) in either benign or malignant liver disease. Thus the clinical significance of AFP-L3 is noted when the total AFP concentration is lower than the cutoff point of AFP. Clinical significance of AFP-L3 was observed early when AFP-L3 increased prior to increase in AFP concentration with progression of cancer. In the 1990’s, ultrasound was the main recommended monitoring method for HBV- and HCV-positive patients with chronic liver disease in Japan. The aim was to detect isolated nodules of less than 2 cm by ultrasound. However, some kinds of nodules were difficult to detect. AFP-L3 level was shown to increase earlier than ultrasound detection of nodule by retrospective analysis13-17. The concentration of AFP showed fluctuation in liver inflammation and other conditions with no evidence of HCC. 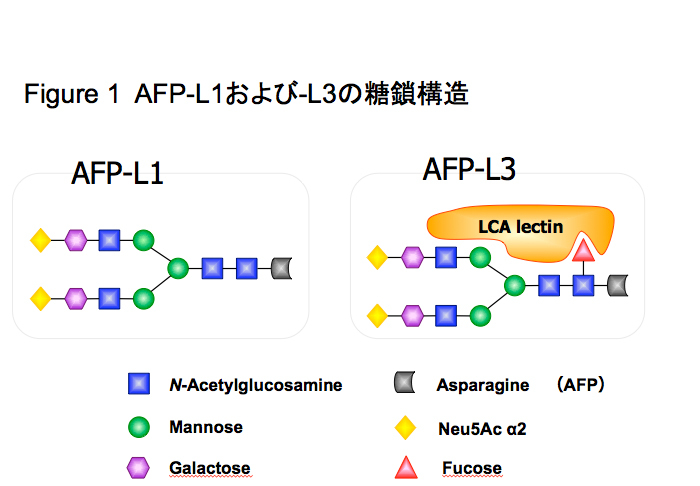 AFP-L3 is more specific to cancer. In the 2000s, as a result of advances in CT/MRI, diagnosis of cancer changed from pathological findings of biopsy tissue to focus more on the blood supply towards cancerous nodules. Newly developed CT/MRI enabled detection of cancerous nodules of less than 1 cm. At that time, three HCC biomarkers, AFP, AFP-L3 and DCP (PIVKA II), were used widely in Japan. However, the use of AFP-L3 was limited to very small HCC compared to CT/MRI. In 2010, the microchip capillary electrophoresis method11 was developed and detection sensitivity and accuracy at lower AFP concentrations improved. Several studies were conducted to show the clinical significance of high sensitivity AFP-L3 assay18-21. Furthermore, AFP-L3 is useful to determine malignancy of HCC and prognosis after treatment. One study showed the relationship between cancer malignancy and AFP-L3 level compared to the blood flow level into the nodules and tumor doubling time22. A comparison with pathological findings of HCC nodules has also been reported23. The clinical significance of AFP-L3 for prognosis after TACE (Trans arterial chemo embolization)24,25, surgery26,27, small HCC28,29 and liver transplant30 has also been reported. When the AFP-L3% level remained elevated after treatment, prognosis was poor. Three biomarkers, AFP, AFP-L3 and DCP, are used for the diagnosis and prognosis of hepatocellular carcinoma worldwide. Elevation of the three biomarkers was observed in different patients at an early stage of hepatocellular carcinoma and the comparative effects observed31. By statistical analysis of the elevation of biomarkers, a new score, GALAD, was developed by international study32. GALAD score is calculated using five parameters: G; gender, A; age, L; AFP-L3, A; AFP, and D; DCP. The calculation formula of GALAD is as follows: GALAD=-10.08 + 1.67 x Gender + 0.09 x Age + 2.34 x log10(AFP) + 0.04 x AFP-L3 + 1.33 x log10(DCP). AUROC (Area under receiver operating characteristic curve) of GALAD is reported to be 0.97. It is statistically better than the use of a single biomarker or a combination of three biomarkers33. GALAD score consists of objective and accurate serum biomarkers so similar results are obtained in various countries33-35. Another merit of the GALAD score is the cost benefit compared with expensive imaging modalities. Diagnosis of hepatocellular carcinoma has dramatically improved over the past 30 years mainly due to advances in imaging modalities, ultrasound, CT, and MRI. Patients with chronic hepatitis and liver cirrhosis caused by HBV or HCV infection were determined to be a high-risk group for development of HCC in Japan, and these patients were entered into a program for surveillance by ultrasound and biomarkers. In other countries, only ultrasound is recommended for surveillance. However, ultrasound has limitations. It is difficult to detect nodules by ultrasound in patients with fatty liver disease, steatohepatitis or advanced cirrhosis. Moreover, the efficiency of ultrasound depends on the quality of the instrument and the technician. In some countries, even ultrasound is difficult to use for monitoring due to the lack of expensive imaging instruments and skilled technicians. Both specificity and sensitivity of single HCC biomarkers have been improved by the development of the GALAD score, which uses only objective serum biomarkers. Surveillance guidelines will improve worldwide with expanded use of this score . Shiraki K, Takase K, Tameda Y, et al. A clinical study of lectin-reactive α-fetoprotein as an early indicator of hepatocellular carcinoma in the follow-up of cirrhotic patients. Hepatol 1995; 22: 802-807. Toyoda H, Kumada T, Tada T, et al. Clinical utility of highly sensitive Lens culinaris agglutinin-reactive alpha-fetoprotein in hepatocellular carcinoma patients with alpha-fetoprotein <20ng/ml. Cancer Sci 2011: 102; 1025-1031. Kumada T, Nakano S, Takeda I, et al. Clinical utility of Lens culinaris agglutinin-reactive α-fetoprotein in small hepatocellular carcinoma: special reference to imaging diagnosis. J Hepatol 1999: 30; 125-130. Tada T, Kumada T, Toyoda H, et al. Relationship between Lens culinaris agglutinin-reactive α-fetoprotein and pathologic feature of hepatocellular carcinoma. Liver International 2005: 25; 848-853. Yamashita F, Tanaka M, Satomura S, et al. Prognostic significance of Lens culinaris agglutinin-A-reactive α-fetoprotein in small hepatocellular carcinoma. Gastroenterol 1996: 111; 996-1001.